1879: Thomas Edison crowns 14 months of testing with an incandescent electric light bulb that lasts 13½ hours. Sir Humphry Davy had produced incandescent electric light in 1808 by passing battery current through a platinum wire. But the voltaic pile was expensive and could be messy. The invention of the dynamo in 1866 literally generated new possibilities and a few American and European cities had some of their streets illuminated with arc lights by the end of the 1870s. Arc light (where the current flows from one electrode through a gas to another electrode) is bright and harsh. Edison wanted to “subdivide” the light by using the softer glow obtained when electricity passes through a filament and heats it up until it glows. Edison was riding high on the fame and profits from his gadgets for telegraph printing, multiplex telegraphy, telephone improvements and the brand-new phonograph. He figured he and the 40 researchers at his Menlo Park, New Jersey, development lab could come up with a good incandescent bulb in three or four months in 1878. When he prematurely announced that he’d come up with the bulb, stock in gaslight companies took a dive. Edison was unable to devote all his time to the quest: He had to redesign the receiver of his telephone system — which was being marketed in England — to avoid infringing on Alexander Graham Bell’s patent. The lab also had to work on improving electrical generators and developing an electric meter to bill the eventual customers. Edison’s lab put a lot of effort into making a bulb with a platinum filament, but that work went nowhere, because platinum has a relatively low resistance. But gas bubbles in the platinum had led Edison to develop an efficient vacuum pump to remove the air from the inside of his bulbs. And that created a new opportunity: carbon. Carbon conducts electricity, has a high resistance and can be shaped into thin filaments. And it’s cheap. But it burns easily — unless there’s no oxygen around. The vacuum bulbs Edison had created for platinum were ideal for carbon. Edison pushed hard on his research assistants, whom he more or less affectionately called “muckers.” After testing hundreds of materials, they baked a piece of coiled cotton thread until it was all carbon. Inside a near-vacuum bulb, it stayed alight for more than half a day. The “three or four month” project had taken 14 months. Soon, the lab got a carbon-filament bulb to last 40 hours. It had cost $40,000 (about $850,000 in today’s money) and taken 1,200 experiments, but was ready at last for a public debut. On New Year’s Eve, 3,000 people visited the lab in Menlo Park to witness 40 electric light bulbs glowing merrily. Edison switched them on and off at will, dazzling and delighting his guests. These bulbs used carbonized cardboard. Eventually, Edison’s lab tested carbonized filaments made from plants as diverse as baywood, boxwood, hickory, cedar, flax and bamboo. “Before I got through,” he said, “I tested no fewer than 6,000 vegetable growths, and ransacked the world for the most suitable filament material.” Bamboo became the favorite for several decades, but tungsten supplanted it by 1910. Edison didn’t start delivering electricity to paying customers until he opened the Pearl Street power station in New York City in September 1882. So, what we see here is Edison leveraging profits from one invention to finance the next, announcing a product well before it’s completed, dodging and defending intellectual-property disputes, missing a big deadline, working his development staff feverishly, unveiling a prototype in a splashy and impressive event, and still needing more time before it was actually available to end users — in select markets, of course. If that pattern reminds you of any tech mogul of our own time, that’s your business. Or his, actually. 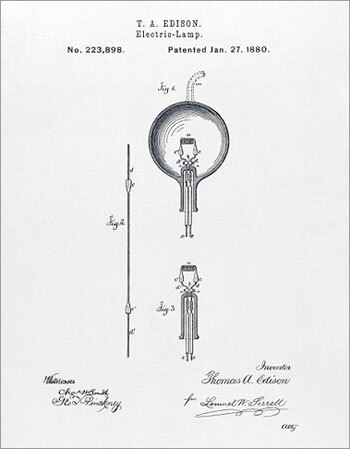 Image: Thomas Edison received a patent for his light bulb in January 1880. This article first appeared on Wired.com Oct. 21, 2008.